This place looks really cool, hopefully one day I can visit ! 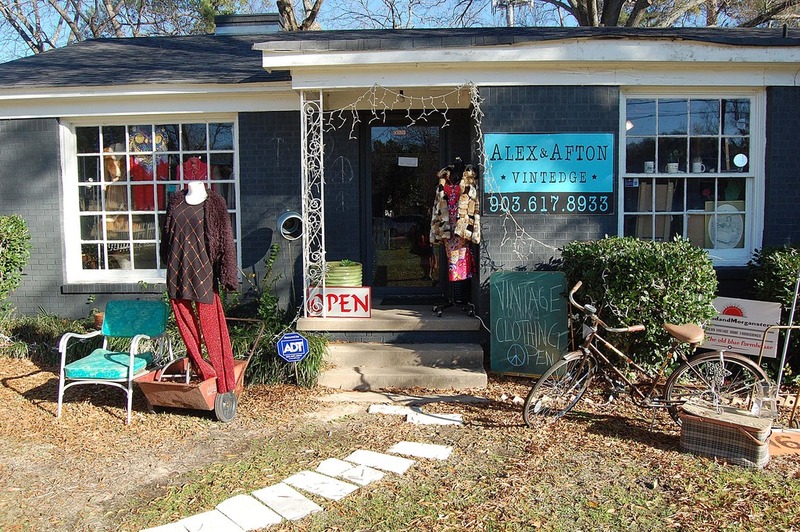 Deep in the heart of East Texas…in the bustling small city of Tyler, lies the only vintage shop in town- Alex & Afton Vintedge. It’s nestled in a converted old single-story home off Old Bullard Rd., complete with white picket fencing. It’s not hard to miss, as the signage is as clear as day and there are mannequins and other eclectic items on the porch, beckoning customers to come in. Caitlin Brax is the shop owner and the shop’s Instagram model. She’s that bohemian spirited, cool gal who can easily also be your best friend. Her passion for vintage started when she was in high school. While living in Los Angeles, she worked at an upscale boutique. Her clients would always want what she was wearing (vintage). So that (and her love of working retail) got her creative entrepreneurial juices flowing and she opened up an Etsy shop. Upon moving back to Texas, she made it a goal to never work for someone (at least in the town she was living in at the time). 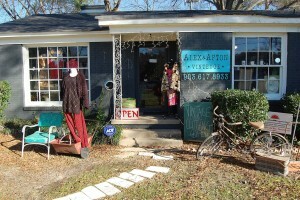 She gathered up her and her mother’s vintage collections and opened up a space in February 2012. The space outgrew itself and she opened the current location of Alex & Afton on November 1, 2013. She named the shop after her sister and her’s middle names. Her inventory includes pieces from the 1950’s to early 2000’s, however she personally prefers the 60s, 70s and some 90s (not so much the acid wash, but more like the minimal, Calvin Klein slip dresses 90s). The curated collection is meant to be non-costume-y, rather more ‘cool girl’-pieces that one can easily blend into their current wardrobe. “It’s easy, it’s cool…it’s not work,” Caitlin also refers to her buying aesthetic as a little rock n’ roll, some glam and some bohemian. She also carries her mother’s Mod Melrose collection. The brand’s name is in homage to her grandmother- Jean Melrose. What started out with only caftans (and quickly sold out), has now expanded with jackets, tops, dresses and turbans. Her mother uses vintage patterns and fabrics whenever possible. The Mother-Daughter duo wants to “blow open any limitations that they had put on themselves for 2016” in terms of the brand. They also do custom orders!